Formula 1 is a sport that is both rich in history and controversy, but has been somewhat lacking as a topic in thriller fiction… that is until now. The Ringmaster is Toby Vintcent’s third venture into this emerging and almost self-created genre. 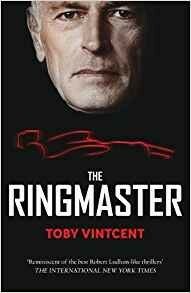 Best-described as a political thriller, The Ringmaster provides great insight into the inner workings of Formula 1 as a sport, as well as a commercial enterprise where vast sums of money flow in and out. Vintcent’s narrative follows the career of a fictional “Ecclestone-esque” character (Arno Ravillious) and the power that comes from the commercialisation of Motor Sport. The novel documents his struggles with control over the sport, and the changes within the world of Formula 1 (F1). It also details the rivalries and vendettas that plague sports when vast sums of money are involved. Toby’s motorsport knowledge is apparent throughout the story with his ability to striate the reality of this sport into an exciting, and nail-biting fictional narrative. Within a few chapters I was able to quickly associate the fictional characters and organisations within this thriller, with their [alleged] real-world counterparts. In particular, I would say Toby nails the narrative within the first few chapters in terms of emotion, thus setting the tone of this extraordinary thriller. Having attended the Silverstone Grand Prix professionally, earlier this year, I can verify the veracity of the technical details, as well as the emotions he outlines in The Ringmaster. The blurred lines between truth and fiction leave you Googling events to see which incidents actually happened, and which were torn from the writer’s imagination. I would highly recommend this book to motorsport fans anywhere, having a fictional thriller in a realm you are passionate about is truly welcome. However I do believe that the appeal for this novel is far wider; as the story of a commercial giant in transition, and the political struggles that come when it comes to control, are indeed universal. Well worth taking a pit-stop to the bookstore to meet the The Ringmaster.